This tour package includes your sightseeing of the one of the most beautiful & famous places in Northern & Western part of India, Places covered are Delhi, Agra, Jaipur and Mumbai. It starts with Delhi arrival & sightseeing of historical sights & markets of Delhi, Next stop is Agra the Mughal city & most Iconic Taj Mahal, Than sightseeing of The beautiful Jaipur which also know as Pink City. Next destination will be Mumbai(Earlier called Bombay) which is the Financial capital of India & also famous as the heart of the Bollywood film industry. This morning you will be transferred to Jaipur airport to take a flight to Mumbai. On arrival at Mumbai airport pick up and transfer to hotel. Later visit Siddhivinayak temple , Mahalakshmi temple & Haji Ali and Overnight in Hotel. 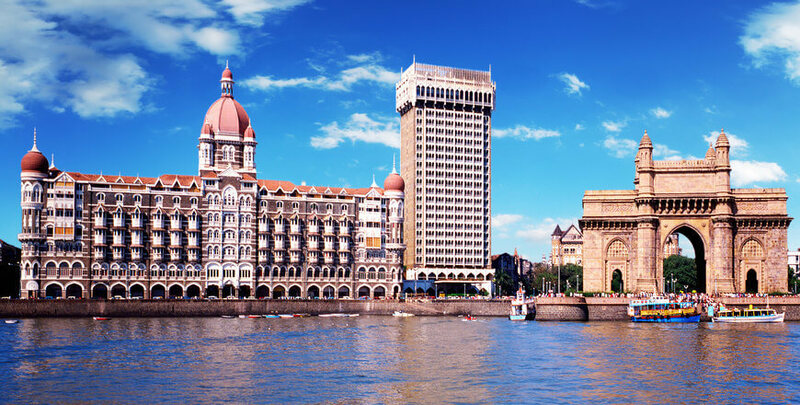 This morning take a full-Day sightseeing tour of Mumbai city, rich blend of East and West. The tour includes visits to 26 meters high British-built Arch Gateway of India , Mumbai landmark built to honour the visit of George V and Queen Mary in 1911. Marine Drive dubbed, as the Queen Necklace is Mumbai most popular promenades and a favorite sunset watching spot. The Kamla Nehru Park from where you have a picturesque view of the city, Hanging Gardens are so named since they are located on top of a series of tanks that supply water to Mumbai. Pass by the towers of silence the crematorium of the Parsis. Also visit Mani Bhawan a private house where Mahatma Gandhi used to stay when he visited Mumbai. It is now a museum and research library with 20,000 volumes. Return to hotel for overnight. After the breakfast, pack your baggage with a promise of come back again. Proceed to Mumbai Airport/Railway station on time to board your flight/train with a lot of sweet memories of your holidays. Nights accommodation in hotels on twin sharing basis. All arrival, departure, sightseeings as per above itinerary by air conditioned car with English speaking driver. Entry Fees To Monuments And Palaces. Mandatory X- Mas / New Year Eve Supplementary Charges , That Should Be Paid By The Guest Directly To The Hotels Concerned.. Page rendered in 0.0744 seconds.